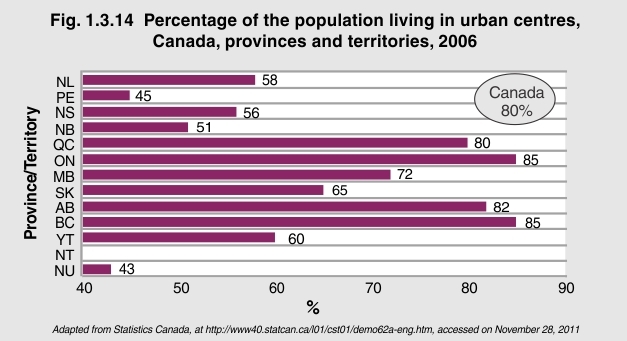 In 2006, 80% of Canadians lived in urban centres. Urban living was most common in Ontario and British Columbia, where 85% of the population lived in urban centres. Urban living remained the dominant choice of people in many provinces and territories at 82% in Alberta, 80% in Québec, 72% in Manitoba, 65% in Saskatchewan, and 60% in the Yukon. The Atlantic provinces were more closely divided between urban and rural living. In Newfoundland and Labrador, 58% of the population lived in an urban centre; in Nova Scotia, 56% lived in an urban centre. At 51% of its population living within an urban community, New Brunswick was the most evenly split between urban and rural living. Prince Edward Island and Nunavut were the only exceptions to the national trend. The majority of their populations (65% and 67%, respectively) lived in rural rather than urban communities. Where Canadians live is trending toward urban sprawl. At the time of the 2006 Census, about 80% of Canadians lived in urban communities and many of those resided in or close to densely populated city centres1. Large Canadian cities, such as Vancouver, Edmonton, Calgary, Winnipeg, Ottawa-Gatineau, Toronto and Montreal, have become more ethnically and culturally diversified compared to rural towns and villages because new immigrants to the country are choosing to live in urban centres2. accessed on November 28, 2011 at http://www4.hrsdc.gc.ca/[email protected]?iid=34. 2Statistics Canada, 2008. Immigration in Canada: A portrait of the foreign-born population, 2006 Census; accessed on November 28, 2011 at http://www.statcan.gc.ca/pub/11-008-x/2008001/article/10556-eng.pdf.